What a wonderful Christmas! 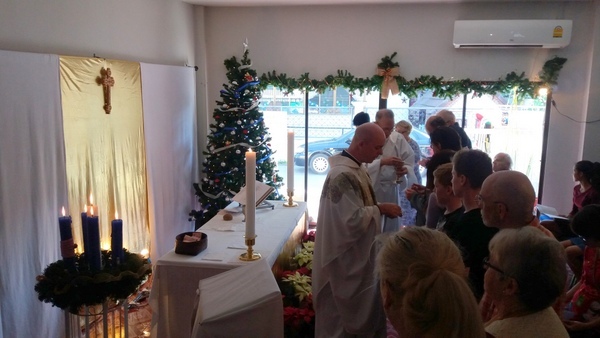 We had around seventy people at our Christmas Morning Eucharist, and good numbers for our Christmas Eve morning service, and for Midnight Mass! 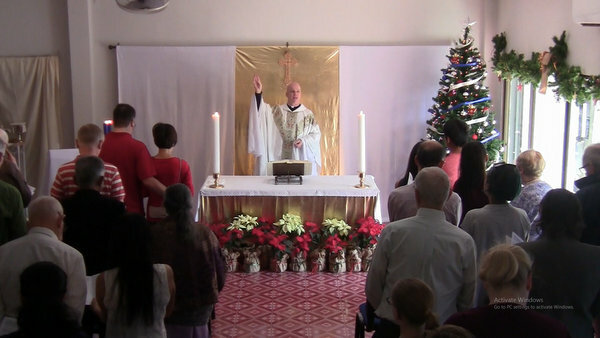 You can watch the video of the Christmas Morning Eucharist here! 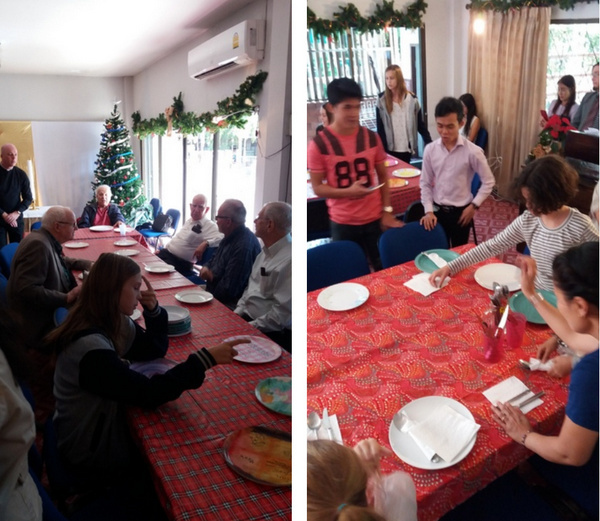 Then following the Christmas service, forty people joined us for Christmas lunch, with the best turkeys in Chiang Mai! Thanks to the Chase family and all the others who organised and brought the food! Getting Ready to Eat Together! 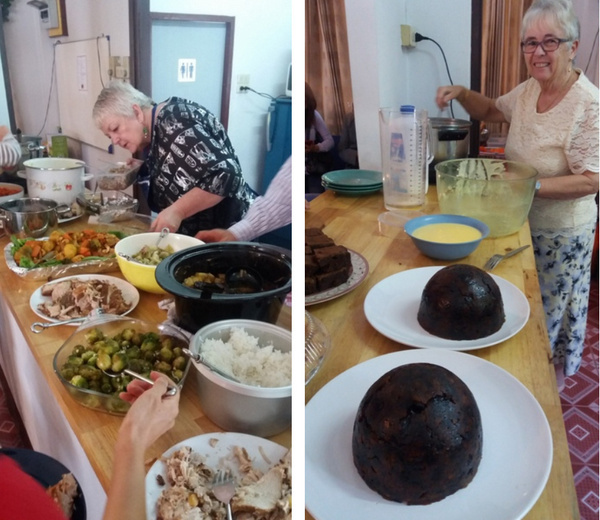 Turkey Main Course and Christmas Pudding Desserts! 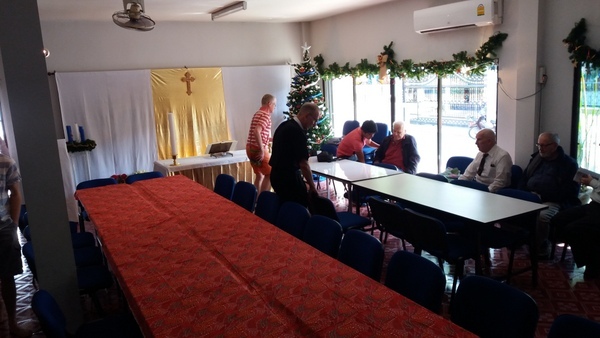 We continue our Christmas celebrations this New Year’s Eve as we meet for our usual Sunday Worship at 11a.m. Our readings will be Isaiah 61:10-62:3, Galatians 4:4-7, and Luke 2:22-40, and we will be singing O Come All Ye Faithful, Angels We have Heard on High, Cradled in a Manger Meanly, O Little Town of Bethlehem, Silent Night, Good Christian Friends Rejoice, and Joy to the World! The readings can be found via this link ! Thank you again to all those who assisted in moving me into my new house. Particularly Ken, Emily, Pamela, Pat, Julia, Richard, Jufil, Gene, Kong, Rachapol, Arianna, Chris, and Warren, and thanks to all the others who also offered their services! Everyone at All Saints is invited to a house-warming/New Year’s Eve Party at my new house on New Year’s Eve, beginning at 8 pm. Just drinks and nibbles, so eat first! If you don’t know the way to All Saints, directions can be found on the Where and When page. Most people get to hear about us via the internet or by word of mouth, so please feel free to pass on this email to others. All are welcome to join us as we share the presence of the Christ of Christmas in our lives! We hope to see you soon and that you will enjoy worshiping with us, meanwhile, have a great Christmas and a Happy New Year! God willing, I will be back in Chiang Mai this Thursday. When I left on 19th November I did not expect to be away for over a month, nor did I expect to lose my father and be returning to Thailand with my mum. But God has been with us all through this difficult time. 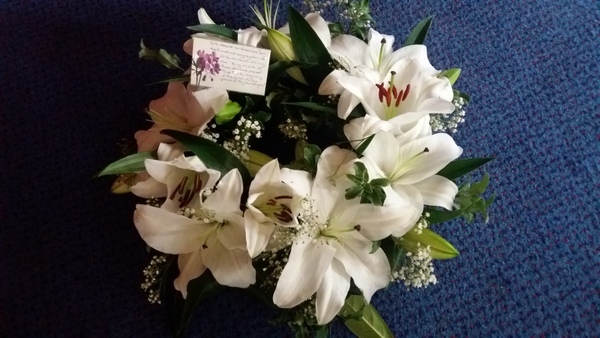 Although we did not expect to lose my dad anything like so soon – his parents lived into their nineties – I feel it was God’s timing and he would soon have been very ill and unhappy. If any of you would like to see the funeral and celebration of his life it can be viewed via this link. I cannot express my thanks enough to all the support you have shown me over the last month. All Saints has gone from strength to strength in my absence, and it shows what a great bunch of people we have! Thank you! We have three Christmas services this week: our Sunday morning Eucharist at 11 a.m. on Christmas Eve, then our Midnight Mass at 11:30 p.m., and our Christmas morning service at 11 a.m. on Christmas Day! You are welcome at any or all of the services! Nate Tipton will be preaching on the morning of Christmas Eve, and I will be back in place, preaching for Midnight Mass and Christmas morning! I am looking forward to being back and seeing you all again – I have missed you! Our readings for this fourth Sunday of Advent are 2 Samuel 7:1-16, Romans 16:25-27, and Luke 1:26-38, and the hymns are O Come All Ye Faithful, The Angel Gabriel from Heaven Came, and Hark! The Herald Angels Sing! Then for Midnight Mass we will read from Isaiah 9:2-7 and Luke 2:1-20 and be singing O Come All Ye Faithful, Infant Holy Infant Lowly, It Came Upon a Midnight Clear, Silent Night, and Hark! The Herald Angels Sing! On Christmas morning we will read from Isaiah 52:7-10 and Luke 2:1-20 and be singing O Come All Ye Faithful, Away in a Manger, See Amid the Winter’s Snow, Ding Dong Merrily on High, and Hark! The Herald Angels Sing! Sunday Morning Eucharist at 11 a.m. Midnight Mass at 11:30 p.m.
Family Eucharist at 11 a.m. This will be a full sit-down Christmas lunch with all the traditional trimmings! I will be bringing turkeys and Christmas pudding from England! Please call me or Gene if you have not already signed-up and would like to come! 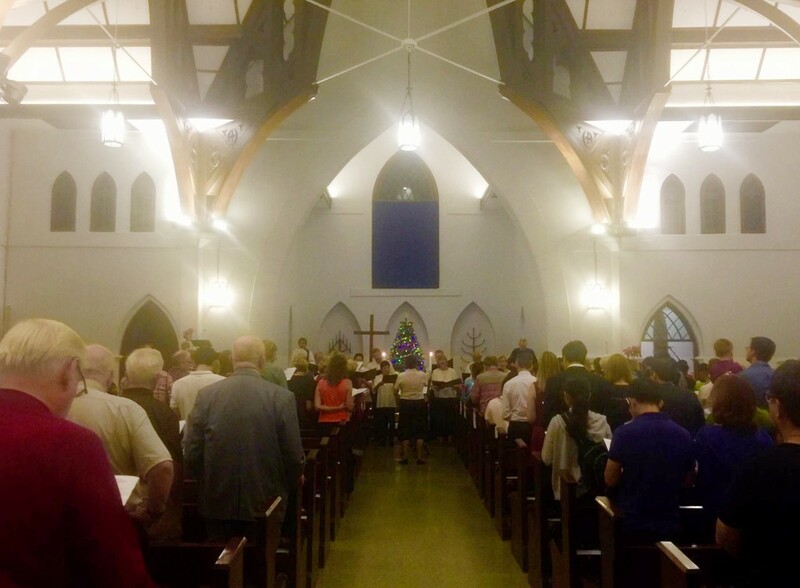 Last Week’s Festival of Nine Lessons and Carols! Thanks to all who worked so hard to make the All Saints Festival of Nine Lessons and Carols such a success. I have watched the video on YouTube and it looks wonderful, I am only sorry that I could not be there myself. 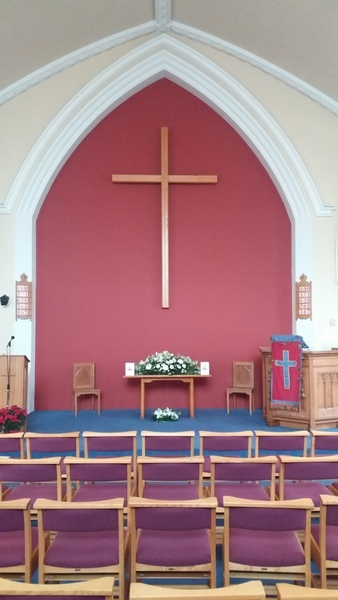 You can watch the service via the Audio-Visual page of the All Saints website! This coming Sunday Mark Crawford will be both preaching and celebrating communion. Thanks, Mark, for all you are doing, and thanks to everyone else who have kept things running so smoothly at All Saints in my absence! Our readings for this third Sunday of Advent are Isaiah 61:1-4, 8-11, 1 Thessalonians 5:16-24, and John 1:6-8, 19-28, and the hymns are Come, Thou Long-Expected Jesus, Of the Father’s Love Begotten, and As with Gladness Men of Old. The readings can be found via this link ! Thanks for all your thoughts, prayers, and support. I will be back, along with my mum, on 20th December, and I look forward to seeing you all again on Christmas Eve! This will be a full sit-down Christmas lunch with all the traditional trimmings! Different people will be asked to bring different dishes so please sign-up at the back of the church if you intend to come. I will be bringing turkeys and Christmas pudding from England! 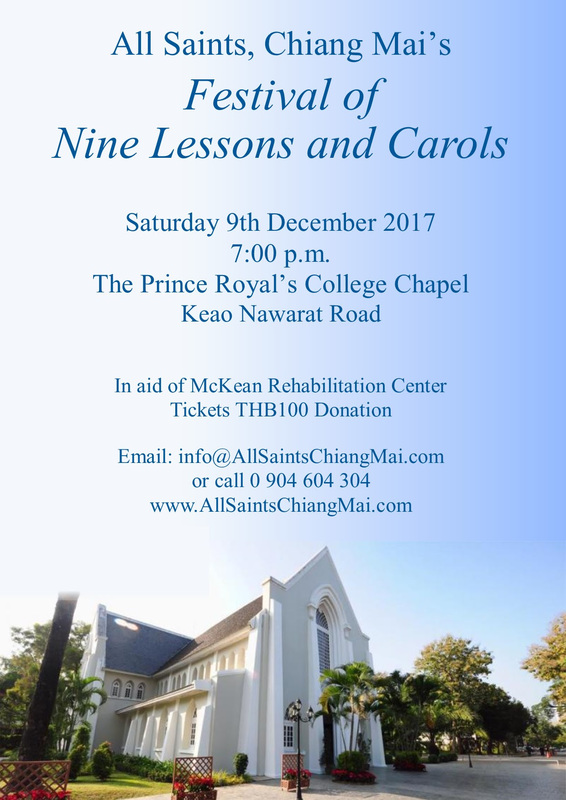 Festival of Nine Lessons and Carols! 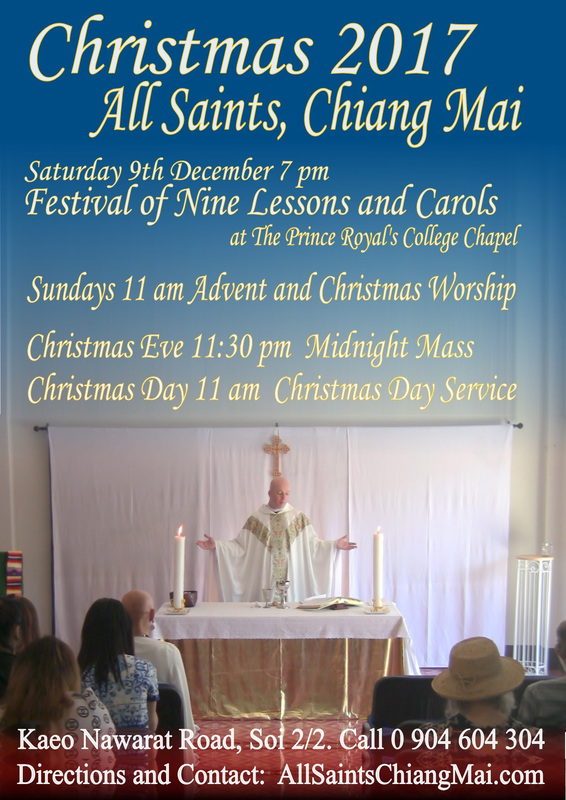 This Saturday we have our annual Festival of Nine Lessons and Carols in the Prince Royal’s College Chapel. This will be a very special event! Please spread the word and invite your friends. Thanks to Chris, Tarntip, the Chase family, and so many others, for taking over the organisation of this event! The Festival should be a wonderful time of worship and reflection as familiar carols are sung and familiar readings proclaimed. Four diplomatic consuls will be reading, along with representatives of different expat organisations in Chiang Mai, and the singing will be led by the Lannacapella Choir! As most of you will know, I am still in the UK and so will be unable to take part this Saturday. I am very disappointed not to be with you for this event and all the other activities of Advent, but many thanks to so many people who are holding the fort in my absence. My dad’s funeral will be this coming Tuesday, 12th December, and I will be returning to Chiang Mai, along with my mum, on the 20th December. 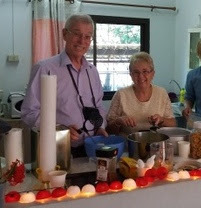 There is much to do here in organisation of the funeral and in arranging my dad’s affairs, so I appreciate all your love and prayers, and all the practical help so many have given me back in Chiang Mai, not least in moving house! On Sunday, following our very special Festival of Nine Lessons and Carols, we will have our usual Sunday morning Eucharist. Mark Crawford will again preside, and Taylor Pfaff will preach. Our deacon, Gene Bourquin, will again assist, making sure everything runs smoothly in his calm professional way. Our readings for this Second Sunday of Advent are Isaiah 40:1-11, 2 Peter 3:8-15, and Mark 1:1-8, and the hymns are O Come, O come Emmanuel, Once in Royal David’s City, and O Come, All Ye Faithful! The Christmas poster is still available for distribution at the back of the church. Please take one. We need to make sure that a Christmas 2017 poster is in every Rimping supermarket. They need to be handed in at the information desks before 15th December for display for the next two weeks. Saturday December 9th 7 p.m.
at The Prince Royal’s College Chapel.